Today is “Autistics Speaking Day“, in place of what might have been the second “Communication Shutdown Day”. Sound like quite the conflicting sort of turn of events? Last year, a group out of Australia started “Communication Shutdown Day” on November 1st where neurotypical people (those without Autism) were to sign off from Facebook, Twitter and other social sites in an effort to better understand what it is like to be non-communicative, or unheard or… well, autistic. With all the best intentions in the world, this idea made very little sense to most people since shutting down in order to speak out was a bit of an oxymoron and also, social sites were proving to be the first real way in which Autistics could finally have a voice in the first place. I wrote a piece last year about why I won’t be shutting down for November 1st, as did many others.. and so, it would seem, no real effort was made to continue to the project on for a second year. What did come of the shutdown day project, however, was a whole new day in which, autistics do the opposite of shutdown… they speak out. A day in which autistics share their struggles, celebrations, strengths, weaknesses and experiences in general with as many people that will listen. That’s a much better use of a day, if you ask me. In fact, that would be a much better use of every day. But obviously, trying to give every day a name is a little tougher than you’d think. Still though, a day where autistics can share with the world is a great start and far better than asking others to stop talking…. or is it? Contradiction or merging of ideas? Still though, when I stop and think about it… is it really that much of a contrast? The shutdown day project asked that non-autistics stop visiting their social networks and to go silent… which all by itself really is a dumb thing to do. However, in conjunction with “Autistics Speaking Day”… it’s starting to actually make a lot more sense to me. If autistics can have a day where they can speak their mind, tell their tales, share their experiences and speak their mind… free of judgments or criticisms from others… well, the whole thing starts to make a lot more sense. Maybe if “shutdown” was changed to “shut up and listen”, then the two days truly would be the same thing, rather than opposites. Instead of abandoning social networks, if we were encouraged to seek out social networks and find as many autistics as we can that are sharing something today and just listened rather than putting in our own 2 cents…. maybe November 1st really wouldn’t be all that different from what it was originally supposed to be… maybe it’s just an extension of it. Perhaps if autistics make an extra, and sometimes difficult, effort to open themselves up to the world and share their experiences and thoughts on Autism, and everyone else made an effort to set aside an hour or two to seek those autistics out, and really just listened, we would finally have a day that made perfect sense. 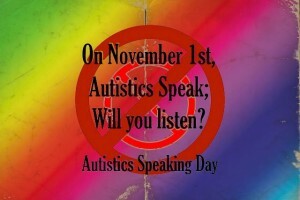 So, if you have Autism, I encourage you to take part in “Autistics Speaking Day” today, November 1st. And if you do not have Autism, I encourage you to seek out some autistics on Twitter, Facebook or even in good ole Google search and spend a little time reading today. The more that is shared and the more people listen, the greater the opportunity for understanding and acceptance for all people with Autism. ← Breaking the Autism barriers with technology, but who’s barriers are they? Actually, it’s the second annual Autistic Speaking Day. Many of us provided posts last year in support of it and against shutting down (as you did), and those posts are collected at Corina and Kathryn’s blog for this year (last year they used a facebook page to spread awareness of the event). It would have been appropriate, Stuart, if you had given proper credit to the adults with autism who instigated the 2010 Autistics Speaking Day by naming and linking to them: Corina Becker (who blogs at No Stereotypes Here) and Kathryn Bjornstad (who blogs at Katy Doesn’t Live in Smithton). I am so proud that Autistics Speaking Day has continued while the Shutdown did not. It is a special day for me to post, and also to “shut up and listen” to all the other participants! I’m sorry Liz, I didn’t realize that this was all about them. While I do agree that they certainly do deserve recognition, I don’t think they started this day for that purpose and so no, it is not necessarily “appropriate”. I don’t mention the instigators for Thanksgiving, Autism Awareness Day, remembrance Day or any other day either.